(CBS News) CRAIG, Colo. -- Appearing in Colorado's coal country, Mitt Romney on Tuesday sought to make the case that President Obama's energy policies have hurt communities like these - in the face of evidence indicating otherwise. The former Massachusetts governor, who is expected to formally clinch the GOP nomination in Texas' primary later Tuesday, told a crowd of more than 800 people that Obama's policies have been responsible for the problems in Craig, located in the state's rural northwest corner. "I'm not going to forget communities like this across the country that are hurting right now under this president," Romney said. "I'm not going to forget middle-class families that are asking themselves why is it that three and a half years after this president got elected, we're still in a tough economy like this." In fact, Craig's recent economic situation has been largely positive, said the town's mayor, Terry Carwile. "Nobody's been laying people off or anything like that," said Carwile, a retired coal miner. "As a matter a fact, they've been hiring." Coal production in Colorado and Utah rose 25 percent in the third quarter of 2011 compared to the same period a year earlier, according to a November 2011 Denver Post article. The political website ColoradoPols.com also indicated that the problems Craig and other coal-producing communities have suffered are due to state and not federal issues. It said the biggest perceived threat to Craig's coal production is not Environmental Protection Agency regulations, but a bipartisan law signed in 2010 that aims to convert some of Colorado coal energy production to natural gas by 2017. The Obama campaign chimed in with a series of statistics that it said refute Romney's arguments. "Domestic oil production is at an 8-year high, our dependence on foreign oil is at a 16-year low, renewable energy production has nearly doubled, and natural gas production has increased every year under President Obama to an all-time high," spokeswoman Lis Smith said. "And under President Obama's leadership, investments in the clean energy sector have supported more than 200,000 jobs, employment in coal mining has reached a 15-year high, and the oil and gas industry has added tens of thousands of jobs." In apparent anticipation of such criticism, Romney said that Obama can't take credit for any recent economic improvements. "His campaign these days is trying to find a twig to hang on to, some little excuse they can grab and say, 'Look, things are getting a little better, aren't they?'' he said. "And the answer is yeah, things are getting a little better in a lot of places in this country, but it's not thanks to his policies. It's in spite of his policies. You see, every recession ultimately comes to an end, but you'd expect that this deep recession might come back to an aggressive turnaround, but it didn't happen." Romney appeared in Craig at the invitation of motel owner Frank Moe, who reportedly sent Romney a video produced by a group called Energy for America. The video, "The Perfect Storm Over Craig, Colorado," highlights the community's economic dependence on the energy industry. Introducing Romney at the event, Moe said that when he "cried out for help and relief from Obama's overregulation of the energy industry and his failed economic policies that are hurting out community, Mitt Romney is the one who answered the call." Energy for America is a joint project of Americans for Prosperity, the American Energy Alliance, and the Institute for Energy Research. Americans for Prosperity is among the political groups that has received funding from wealthy conservative brothers David and Charles Koch. In an interview with Colorado radio station KRAI, Romney elaborated on his energy-related plans if he's elected. He said energy industries deserve credit for proactively taking steps to reduce pollution and other problems. "Our extracting industries have become so effective in remediating lands after they have been mined for coal, for instance, as well as making sure that we're not polluting the air," he said. "We really don't have to say to ourselves that we can't afford to have oil coal and gas as part of our energy mix." 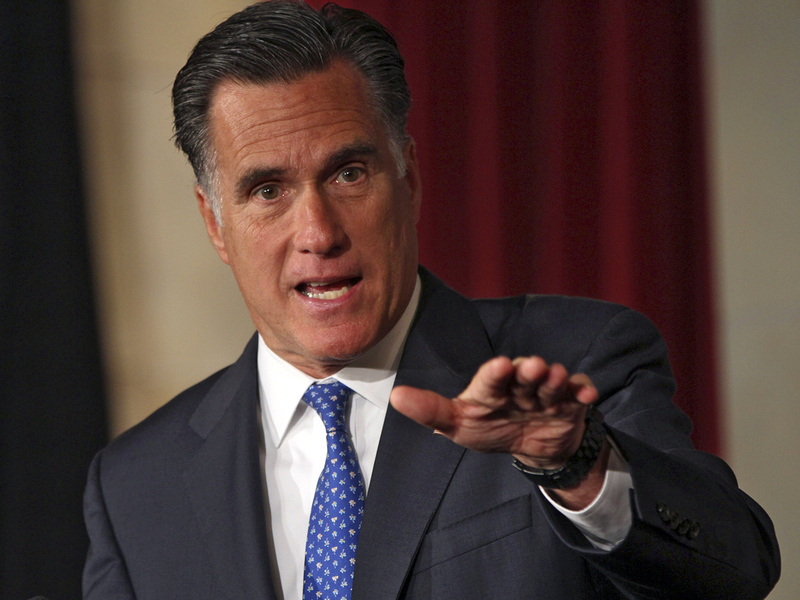 Romney has criticized Democratic efforts to regulate greenhouse gas emissions from coal plants and other sources through a cap-and-trade program. He indicated that other countries need to do more to regulate greenhouse gases without the United States being forced to take the lead. "I know there are some who are very concerned about carbon dioxide emissions, so-called greenhouse gases, and they feel that these sources are going to be contributing to global warming," he said. "But you know, they call it global warming, not America warming, and the idea of America unilaterally saying we're not going to take advantage of these abundant energy resources, it would put us in at an enormous economic disadvantage relative to other countries," he added.